It may seem hard to get through a day without generating trash or even recyclable waste. The easiest ways to buy products, clean surfaces and perform other tasks often involve disposable items. However, you can often reduce your environmental impact and save money by replacing standard disposable items with reusable alternatives. Even if you buy disposable items made with recycled and recyclable materials, they need energy and materials to create. Moreover, they require more energy to recycle. If disposable items end up in landfills, they might take months or years to decompose. Here are 12 categories of disposable products that can easily be replaced with reusable products. 1. Beverage bottles: Disposable plastic water bottles are one of the great demons of the environmental movement, sending unnecessary plastic into the landfill. A variety of reusable metal and plastic alternatives are widely available. They are typically more expensive than a bottle of Evian, but they are infinitely refillable, saving plenty of money in the long run. Also consider reusable bottles and cups for soda and other beverages. Milk containers pose other environmental problems. While plastic jugs are typically recyclable, they often end up in the landfill, where they may take hundreds of years to decompose. However, old-fashioned milk delivery in reusable glass bottles is becoming popular again. Also, more vendors, particularly natural foods grocers, are offering milk in reusable glass or plastic bottles. To be sure, production and transportation of glass bottles is quite energy-intensive. However, reusing the glass and getting milk from local dairies significantly reduces the environmental impact. 2. Plastic bags: Disposable plastic grocery bags, though convenient, are another environmental scourge. An estimated 60,000 plastic bags are used every five seconds in the U.S. However, it seems that with each passing month, more shoppers at local grocery stores are bringing reusable bags made of cloth, canvas or other materials. Smaller disposable plastic produce bags can also be replaced with cloth bags. Also look for bulk bins, and bring your own containers for grains, snacks, cereals and other foods. Instead of getting cereal in a disposable waxed paper bag within a disposable cardboard box, just put it in your own container. You can even pour cereal or other foods into your own glass jars for home storage. Just be sure to measure and mark the tare, or empty, container weight. 3. Takeout containers: Even if you bring reusable containers and bags to clean up your act at the grocery store, you may still get plenty of disposable materials when you eat out. Fast food outlets and other restaurants that use plastic cutlery and containers generate plenty of waste. But you can help reduce the waste stream by carrying your own metal or bamboo utensil sets, and bringing reusable food containers. Some restaurants may bar such containers for fear of cross-contamination. However, others encourage reusable containers, recognizing the financial and environmental benefits. At the very least, they can’t stop you from putting leftovers in your own container instead of their disposable plastic or Styrofoam boxes. 4. Coffee cups and filters: Many of us can’t do without our daily coffee, but we can enjoy it sans disposable cups and filters. 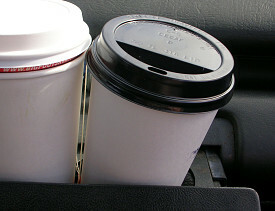 Carry a reusable mug in your car for coffee on the go, and keep one at the office for workplace coffee. Many coffee shops even offer a discount for java junkies who bring their own cup. For making coffee at home, consider replacing disposable paper filters with permanent filters made with stainless steel or other products. Also try substituting bulk ground coffee in reusable containers for disposable single-serving packages. 5. Toiletries: Next, it’s time to brush away the coffee breath. While a partly disposable toothbrush is essentially unavoidable, you can reduce 93 percent of toothbrush waste by replacing the head on these reusable toothbrush handles. Likewise, disposable razors can be replaced with less wasteful (albeit more expensive) razors with permanent handles and small disposable heads, which last longer than many disposable alternatives. Other less wasteful alternatives include straight razors and electric razors. Of course, the latter require energy for charging, but they don’t need hot water or shaving foam. 6. Baby diapers and wipes: In 2006, American babies wore 3.6 million tons of disposable diapers, generating 2 percent of all municipal waste, in the form of stinky plastic balls that might take centuries to decompose. However, the reusable cloth alternative is making a comeback. Cloth diapers can be either washed at home or cleaned through a diaper service. Stacks of studies in recent years have compared the environmental impacts of disposable and cloth diapers. While some studies show that more water and electricity is used in laundering cloth diapers than in producing an equivalent number of disposables, it is undeniable that disposable diapers generate more waste. Moreover, cloth diaper users can reduce energy usage by line-drying. Reusable baby wipes and nursing pads are also widely available. 7. Feminine products: Women in the United States throw out an estimated 12 billion sanitary pads and 7 billions tampons every year. There are several reusable alternatives, including menstrual cups and washable cloth pads. 8. Toilet paper: This may be the toughest sell on the list, but washable cloth wipes can replace standard toilet paper. Another option, although it is a big-ticket item, is to hire a plumber to install a bidet. 9. Newspapers and magazines: As a magazine contributor and former newspaper editor, it pains me to admit that reusable alternatives can replace physically delivered newspapers and magazines. Computers and e-readers offer low-waste options for reading the news, and many laptops and e-readers use relatively little energy. 10. Cleaning products: Replace paper towels and other cleaning products with reusable alternatives. For example, Skoy uses cotton and cellulose to make quick-drying, absorbent cloths that can replace both paper towels and sponges for many cleaning jobs. Swiffer mops are also very popular, but are essentially disposable and quite wasteful. Reusable microfiber cloths do the same job with less waste. Standard disposable sponges can also be replaced with natural cellulose sponges, which can be disinfected in the microwave. These natural cellulose sponges also have another environmental advantages: they're not packaged with embedded chemical disinfectants, like most disposable sponges. 11. Batteries: As a new parent, I am starting to realize that children can generate a steady stream of used batteries, which can only be tossed out in certain safe locations. Avoid the hassle and the waste by using rechargeable batteries and a home charger. Check for compatibility before using rechargeable batteries. There are several types of batteries, and some devices work better with specific types. Also seek out high-quality rechargeables, as their charge levels and longevity are worth the extra cost. Sanyo Eneloops may cost more than $3 each, but they come pre-charged and can be recharged up to 1,500 times. They are widely considered the best rechargeable batteries on the market. 12. Pens and ink cartridges: Disposable plastic pens might be everywhere, but you may be able to write better and generate less waste with a refillable pen. If you let your printer do most of your writing, switch to refillable cartridges. Many companies remanufacture and refill ink cartridges. These professional refills are generally considered a better option than home refill kits, which can be messy and ineffective.